The image at the head of this section is of a small collection of painted and stained glass found close to the location of the rear of the Drawing Room and Conservatory, the thickness of the glass around 2mm makes it unlikely to have been used in the conservatory. Larger fragments of a heavy glass around 10mm thick have also been unearthed at this location, probably from sections of the conservatory. 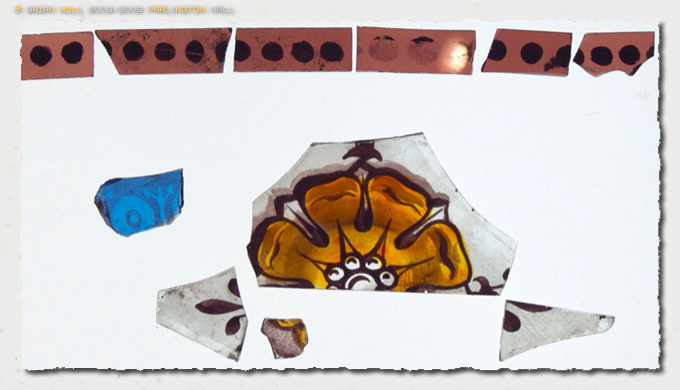 The two Gascoigne sisters Isabella and Elizabeth were noted for their work with stained glass, so it is likely that these pieces are from their work. Large sections of the demolition debris were bulldozed around the site to level off the ground so these fragments may be some distance from their original location. When I first wrote this page [circa 2009] I think I did not say enough about the pieces of glass found that are shown in the header photograph. Therefore to correct this oversight, please read on. The glass neatly falls into three categories, brown with painted dabs, blue etched, and finally hand painted imagery. The brown coloured glass is clearly for a border and has blobs of paint which appear black when viewed on a light box. These are fairly primitive and are the least interesting of the finds. Moving on we see the small blue glass piece or shard this appears to be etched with the lighter area having the acid applied, thus making the blue more transparent, sadly very little of this glass was discovered. Obviously the most striking find was the rose, or flower in gold with a brown border, four pieces of this were dicovered and together they indicate some fleur-de-lis at the edges. It looks like a rose to me, so that is how I have described it. How it was originally presented is of course a mystery, but after it was lost for many many years it is a pleasure to see it revealed again. All the glass was discovered in the area at the rear of the former drawing room. Such was the density of the finds that further investigation should be carried out. I wondered whether the glass was in one location because it had been removed from the hall and stored, perhaps stacked against a wall, then at some point discovered and smashed by a stone or some other object, thus leaving a collection of the glass in one location, but smashed into small fragments or shards! I still have the small collection of finds, they are in a secure CD-ROM case, when I look at them I am always impressed by the craft skills involved. Dangers of Excavating by Hand! 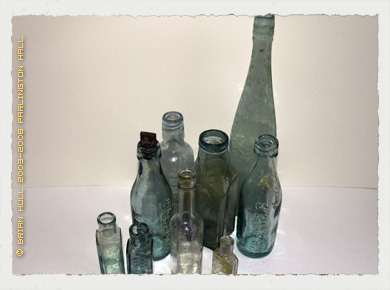 During the excavations around the site of the Hall, care always needs to be exercised as there is a danger of coming across fragments of glass, varying in size from small pieces of crown window glass, through to large chunks of old bottles, usually very ancient wine bottles with very heavy indented bases. So sifting through the fill without using gloves is not recommended. The following items have been discovered intact in the cellar excavations. 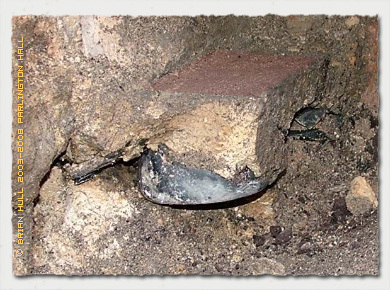 Pieces of floor screed have been discovered with the glass embedded as if for reinforcement. See the picture below which shows a section of floor at the junction of the cellar entranceway and the staircase to the floor above. 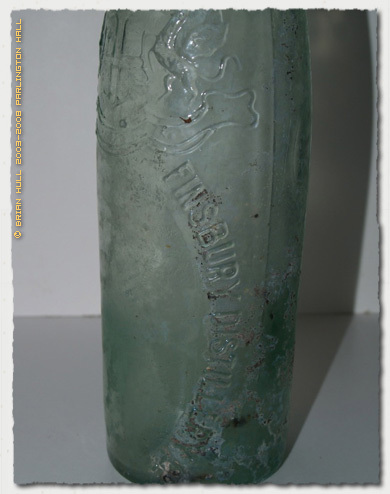 The bottle below whilst not intact has a really good embossed trademark York Bottlers Association Ltd The symbol features what looks like two crossed wooden glass handling implements along with a slightly different third vertical implement, each of the pieces has one of the letters which form the association name YBA. 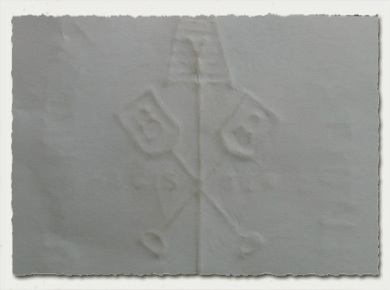 The embossing transfered onto the paper below shows the Yorkshire Bottlers Association trademark. Amongst the fragments of glass found, a small piece of leadlight has been unearthed, it is only around 50mm in length but the back to back U shape to seat the glass shows that glass around 2mm thick was used. Stained glass which has many associations with western religions graduated into an artform from the early medieval period and there are fabulous examples across Europe of this creative practice, glass was usually coloured by adding oxides to the molten glass, for example copper oxide produces a green colour, cobalt: blue, and gold to produce red, although more modern proceses generally do not use expensive additives like gold. 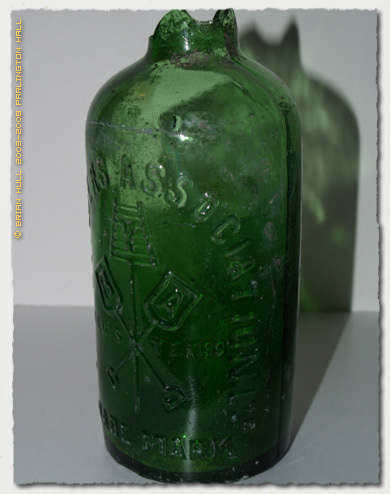 If you would like to know more about old glass, particularly the type found in early sash windows; Crown Glass, I have found a couple of sites which give good details of the history and its use in conservation work today. If you have an old building the important thing is not to remove the old glass and replace with modern float glass as the window will never look right again, the characteristics which make the glass attractive are imperfections that are not present in modern float glass.